This week Young Naturalist J was off from school (winter break) and once I learned the crew would be out trying to band Short-eared Owls . . . I just knew we had to go. Weather was a little iffy but the great banding team did a wonderful job getting everything set up! We saw our first Short-eared Owl foraging in the field once we arrived to the site and J leans over to say “my first for the year”! With one eye on the bird, I introduced Young Naturalist J to everyone and we then headed over to the Northern section where we were assigned to monitor a few traps. We had very little activity and finally decided to eat our subs . . . that’s when we found a Northern Harrier cruising up and down the field looking for its own dinner. The southern section was continuity being visited with Short-eared Owls and Chuck (project organizer) suggested we come over to watch. We then enjoyed watching a Short-eared Owl feeding on a small rodent in one of the fields. North Section Radio: “we have an owl” South Section Radio: “you see an owl or caught one?” Northern Section Radio: “we caught an owl”! Quickly we turn the truck around and B-line for the Northern Section!! Guess what they caught! I couldn’t believe it but they caught a Long-eared Owl!! O My Goodness . . . Long-eared Owls are very secretive birds and not regularly seen (for me at least). This bird was a lifer for Young Naturalist J and confirms the sighting for me (since my last find, I was only 99.9% sure that I was hearing a Long-eared). Excited . . . everyone in the group was excited! I would like to thank Chuck and his entire team for allowing us to join him with his Project. It is very interesting seeing how others banders catch birds and then being able to share these experiences with Young Naturalist J (and everyone else). So, thanks! This entry was posted on 21 February 2008 by mon@rch. 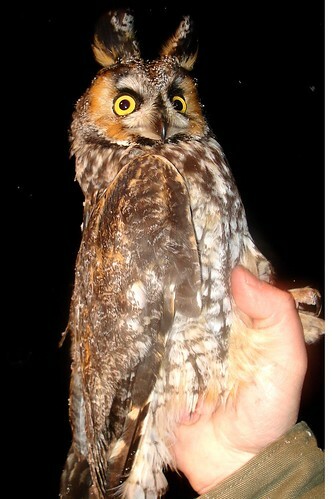 It was filed under Bird Banding, Birds, Flickr, Nature, Ornithology, Owls, Science and was tagged with Long-eared Owl. Congratulations on a great moment for your entire team! 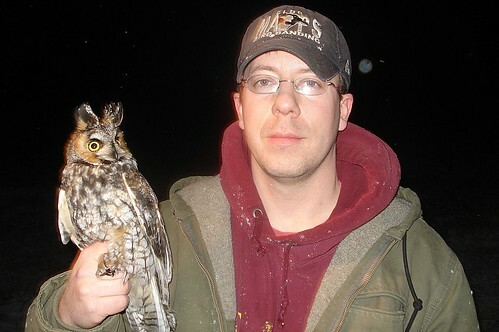 You guys are catching Owls and I’ve rarely ever seen them-awesome pictures too! I love the long-eared owl! For some reason they remind me of cats. How cool! I love that first picture — he looks so surprised! 🙂 Congrats to you both! The first pic looks like an owl/deer caught in the headlights :o) What a beautiful creature. Your harrier in the snow is wonderful. I’m so impressed with what you do. Congrats to you and J! Oh now, this is such a stroke of luck. Beautiful bird. You are some lucky birders. You deserve it for getting out and helping with the banding. congrats. I like the last photo. It kind of looks like you’re holding a hand puppet. Awesome shots – even the far-downs (opposite of close-ups). Love the snow in the Harrier photo. Owls have such a distinctive profile in flight–I’d love to see him swooping low over that field! That’s a wonderful thing you’re doing for them! I love that first picture – the expression is priceless. Great SEOW and LEOW shots, Mon@rch! I love shooting the SEOWs but it’s a real challenge since the light’s leaving just when they get going. I’ve never gotten a good shot of a Long-eared Owl, so I appreciate the close-up views you’ve provided. Love the big eyes..have never seen an owl other that photos! Amazing pics. I’ve tracked down LEO’s this winter and I’m heading out next week to see if I can track down some Short ears. Amazing pics! @ Heather – LOL, thanks and it kind of does have that cat look to it! @ Liza – thanks and it did turn out alright! @ Mary – LOL and they are beautiful for sure! Thanks and the harrier did turn out great! @ Lisa – isn’t that amazing we were there for this bird! Thanks and just glad the let us join them! @ John – you know when holding the birds our hands were not cold! @ NatureShutterbug – thanks and that Harrier did turn out good! @ Rondi – thanks and he’s a great kid! I think kids that are interested should all get opportunities! It is just important that we find ways of giving them these kinds of opportunities! @ Nina – they are so great seeing in flight! Thanks and I think we all should do everything we can to give kids many opportunities like this! @ Jim – thanks and they are a challenge for sure! You are very kind and I can say that I have never capture P Falcons like yours! @ Naturegirl – thanks and hope once you do get to see them! @ Owlman – I thought about you when I did this post! Glad you found it alright! Good luck with your SEOW’s! To hold an owl would be quite an experience, especially a long-eared owl! The pictures are terrific. That LEOW disapproves of all of you. BTW: LOVED that pic of the harrier in the snow. Peaceful. Fantastic. That Harrier flies through snow picture is incredible! Amazing. WOW! 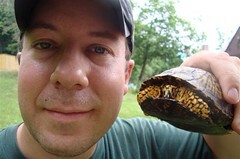 And Young Naturalist J, you are one lucky guy. What a beauty! It’s funny how the ears make for a completely different look. cool guy. 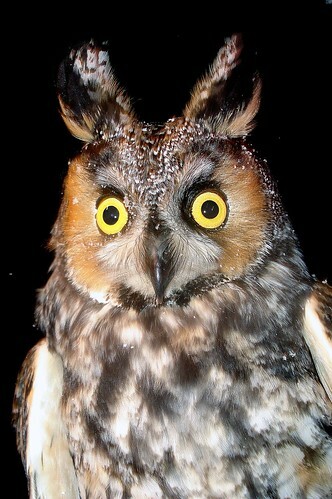 What great pictures of the long eared owl…he looks so shocked and surprised. Lovely pictures. I have never seen one before. Your site is really nice and I always learn so much here. My god, how awesome is this??? Love the shots you get of the birds in flight. Beautiful. Wow, nice! I can certainly see why they call it a long-eared owl. I love to watch harriers fly… haven’t seen one in quite a while though. That’s very cool – there’s a known roost down here, but I haven’t been able to make it to the location (and I’d still need a scope to see it reliably). 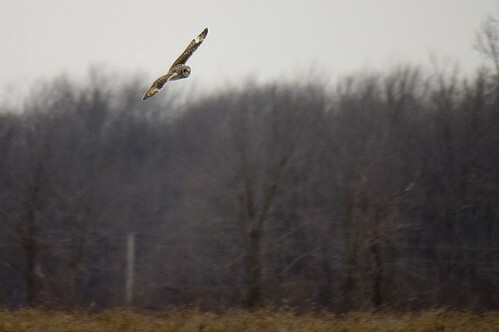 Great pictures of this beautiful bird – and of the shortie and northern harrier, as well. Just curious, but are you holding that owl bare-handed? I would have thought those talons would make that inadvisable! Everytime I see you and an Owl you look so happy! The Long-eared Owl is a beautiful bird. Very wonderful you and the team were able to spend some up close time with him (?). 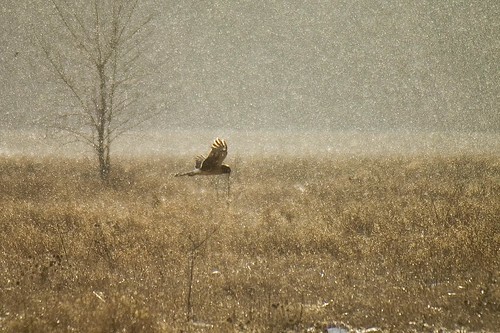 Northern Harrier in the Snow is a fantastic picture. Sherry, who has never held an Owl. Fabulous! Congrats to you and your young naturalists. The northern harrier in flight is terrific and a little surreal. Wow, your owl posts are always great fun to read! I agree with what others have said. You seem to be an excellent mentor for the young naturalists – such a great opportunity for the kids. Great experience (I’m envious)… and excellent photos! Thanks for sharing. I love all the portraits with the long-eared owl. And the grace of the owl to put up with these photographing humans. This is sooo cool Tom that you AND YNJ got to see a long eared owl!! The Northern Harrier is cool, too! Yay you guys! haha, the first picture is quite funny.. with the large eyes as if it’s surprise to see me… I like reading your entries. They are interesting! I was wondering.. is it easy to differentiate a “short-eared” owl with the “long-eared” owl standing from afar? You have the most amazing owl pictures ever! It sounds like a fun night hunting them down. Tomorrow I’m going on a day time owl adventure…wish me luck! @ Linda – it sure is, thanks! @ Susan . . . is that you or is you bird chick? Thanks! @ Trixie – thanks . . it did turn out great! @ aullori – Thanks and many other things make them look different from Short-eared Owls! @ islandrambles – thanks and was ready to take off. Thanks for your kind words! @ Jen – so awesome. . . was lucky for the lighting in them! @ Marg – thanks and can’t believe how many love that shot! @ Rurality – thanks and they do have long ear tuffs! @ Marty – thanks and I hold all birds with bare-hand. They are not rehabilitated birds or even educational birds! When handling them you need to be able to feel there talons or you will regret it! Safer for the bander and bird! @ Sherry – thanks and who wouldn’t be happy! Although both J and myself was very cold in these shots! @ Sottovoco – thanks and was great watching them in the snow! @ Birdfreak – thanks and glad you enjoyed! @ Pinar – they are such cute birds! But, you should thank the parents for allowing the time to let there kids enjoy nature! They should be the model that all parents should follow, I am only a tool for seeing the birds up close! @ KGMom – thanks and maybe this will be one who will be recaptured again one day to tell us more about their natural history. @ Jayne – I am also and whatever he decides to do . . . I know he will do his best. @ Pam – can’t you believe it! It was great for sure, thanks! @ Chicago – thanks and helps having them in the hand. Wish you luck and sure hope you blog about your trip! BUT – Holy Kamoly. You’re handling those birds WITHOUT thick leather gloves. Can’t those talons do you in? Great photos of the long-eared owl–never seen one myself so I appreciate your photos. 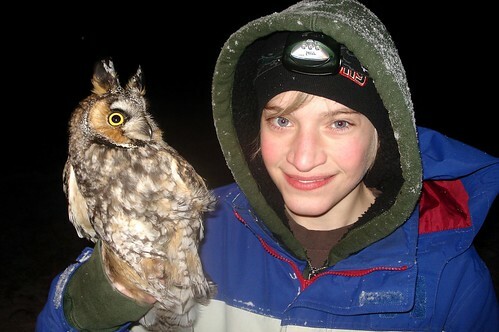 Young Naturalist J is one lucky person–wish all young people had the same opportunity. @ threecollie – thanks and great they are taking the skunks!! Lets hope more for the dogs sake! @ J – sure was and glad you enjoyed it! Was wonderful for sure! @ Cathy – thanks and it is good to see us from time to time! If you know what you are doing both the bird and us humans are safe! The gloves take the safe factor way down and no gloves is the best way to go! @ Joan – thanks and wish I could share these experiences with more people! Wow this post sure brought you a lot of comments. @ Deena – thanks and thanks for your kind words! @ Mel – thanks and that is a “paparazzi” like shot! @ Toni – thanks and brought in many views also! Thanks for visiting as always! Sweet! LEOW would be a lifer for me, and you got fantastic photos of it! Thanks and was very exciting Adam! What a cool photo! I can not imagine getting to hold an owl like that! Wow! Long-eared owl, Wow! I have only seen them once in Colorado when I was training to be a volunteer naturalist with Boulder County. Well worth all the excitement! Great photos! Gosh Tom….how cool for you and YNJ! What great pictures of the Long-Eared Owl. But for some reason I thought they were much bigger (as big as a Great Horned?) Is that an average-sized adult you guys are holding? I found your site through another, and WOW, I’m glad I did. Your photos are incredible!! I just love this owl, beautiful shots. P.S. I want your camera, you get outstanding shots!! Hi! Those are great pics. Are they people friendly? We live in the Bridgeport neighborhood in Chicago, and tonight we found a deceased long-eared owl in our next door neighbors front yard. I took pics. I was wondering do they prey on cats and or could the cats have harmed it?